There was a time when the Godzilla, King Kong, and Pacific Rim movies all shared the same home. A time when a crossover between those three worlds didn’t just seem probable, it seemed inevitable. That time has since passed—but the director of the upcoming Pacific Rim Uprising doesn’t want to dash all hopes and dreams just yet. Look I think it would be fantastic to have the Pacific Rim universe join Legendary’s Monster Universe. It seems like a natural step. And part of the big overall plan after the third movie we’ve talked about is that could happen. It’s always a possibility. It’s by far not a certainty, it’s merely theoretical at this point, but as a fan myself I would love to see that happen. So, theoretically, let’s break this down. We know for a fact that the Godzilla and King Kong universes are getting ready to cross over. Director Adam Wingard is already hard at work at prepping Godzilla vs. Kong for release in May 2020. There was even tease for it at the end of Kong: Skull Island and everything. That’s happening. 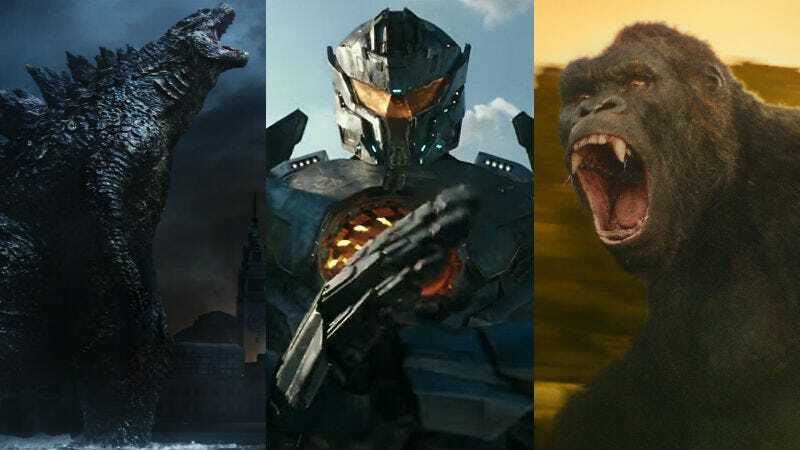 The Godzilla and King Kong movies are being distributed by Warner Bros., which also distributed the first Pacific Rim. That’s the magical time referred to at the start of this article. All three are produced by Legendary Pictures, which moved its business to Universal Pictures a few years ago. However, in the split with Warners, some titles stayed and others moved on. So while the monster movies are still at Warner Bros., any future Pacific Rim movies, starting with next year’s Uprising, will be at Universal. Generally, big movie studios do not share movies or intellectual property. But there are exceptions, especially when there’s a shared production company involved. Spider-Man Homecoming, released by Sony but produced by Disney’s Marvel Studios, is one example. Disney, which owns the rights to M. Night Shyamalan’s Unbreakable, is allowing Universal to use those characters in the upcoming Glass. And sometimes, studios split the cost of various parts of a movie and share distribution too. For example, Blade Runner 2049 was released by Warner Bros. in the US and Sony Pictures internationally. So this kind of thing does happen, even if it’s quite complicated, technical, and all about money. That means DeKnight saying talks have already started about the potential for this is good news. The bad news is he also teases that it would happen after a third Pacific Rim and the second one barely got made as it is. So a lot of people have to go see future movies for a Pacific Rim-Godzilla-King Kong crossover to even happen. But, it might. And if it does, can you even freaking imagine? Pacific Rim Uprising opens March 23, 2018. The next Legendary monster movie, Godzilla: King of Monsters, opens March 2019. Then Godzilla vs. Kong is out May 20, 2020.